Is your Blue Eco pump showing a certain code? At this page you can find all possible causes and solutions. The 27 poles stator not only gives an equal propulsion, due to the True Sine Wave technique it also has an unmatched torque. The power module uses True Sine Wave technology for high reliability. Unlike brushless DC motors with square wave technique, BLUE ECO pumps use True Sine Wave technology for the best features: high efficiency (90%), noise free running, high torque, wide RPM range, CO2 reduction. The way BLUE ECO pumps are constructed prevents any internal leakage. The rotor rotates in the same water that lubricates the bearings. With a unique rinse-system, different for both models, the water inside will be continuously changed during operation. The controller is developed by Estrad BV and produced under supervision of the University of Shenzen, China. This leading university is working close together with Europe’s biggest companies and universities in this area. The University of Shenzen supplies the software for the controllers and every controller is individually checked and certified. Every pump also undergoes an extensive test procedure and comes with its own unique test certificate. The Blue Eco pump is the only pump in its class that has both the European CE certifications as well as the German “TÜV Prüfungs and Test Certificate”. This guarantees extra quality and safety. The rotor is the heart of the driving force and needs to fulfill the highest of demands. The 8 pole rotor is built around the tungsten or titanium shaft. This static and dynamic balanced rotor consists of 16 high quality neodymium super magnets. The rotor is protected by a composite layer of aramid fiber reinforced carbon. Both ends have double shaft seal with smooth bearings which sit in a resonance free silicon bedding. As well as making theses pumps capable of handling seawater it also prevents vibrations which can be sensitive to some invertebrates and koi. The pump housing is made from blended ABS and PC (polycarbonate) that unifies the positive features of both materials. Inside the housing the stator is fully cast in epoxy resin is protected by a strong layer of aramid fiber reinforced carbon. 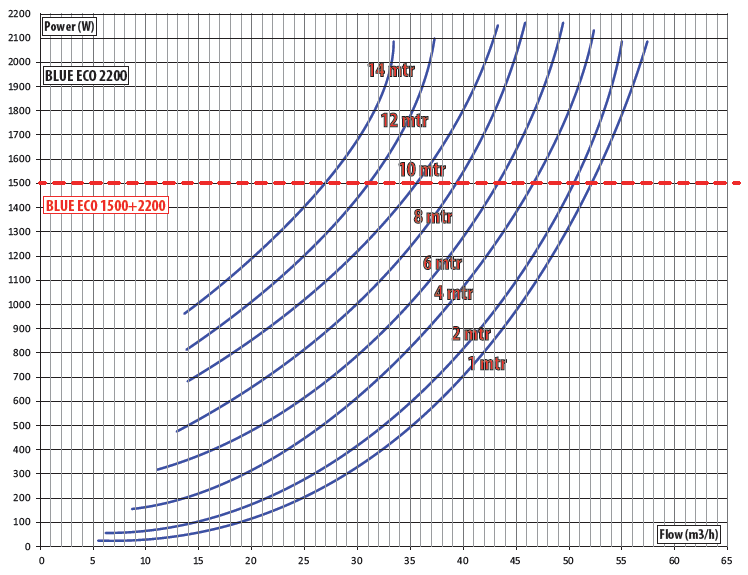 For pumps, the bearing system is the most important part for reliability and life span. Blue Eco pumps have a diamond-hard bearing system of doped silicon carbide with or without the combination of the super strong and durable tungsten. The use of these high quality materials are unique and exclusive for these pumps and guarantee a long and trouble free operation. The pump is completely waterproof confirming to class IP68 (up to 12 meters of water head). The controller is waterproof up to class IP64 (splash proof). Outdoor use in a covered environment is recommended. The cables on the BLUE ECO have extra protection for maximum safety in case of damage. The outer mantle is made of TPE and is fully saltwater proof. Due to this cable the pump can be fully submersible in (sea)water. Download the Blue Eco manual (pdf, 6 mb). It’s in English, Dutch, German and French. 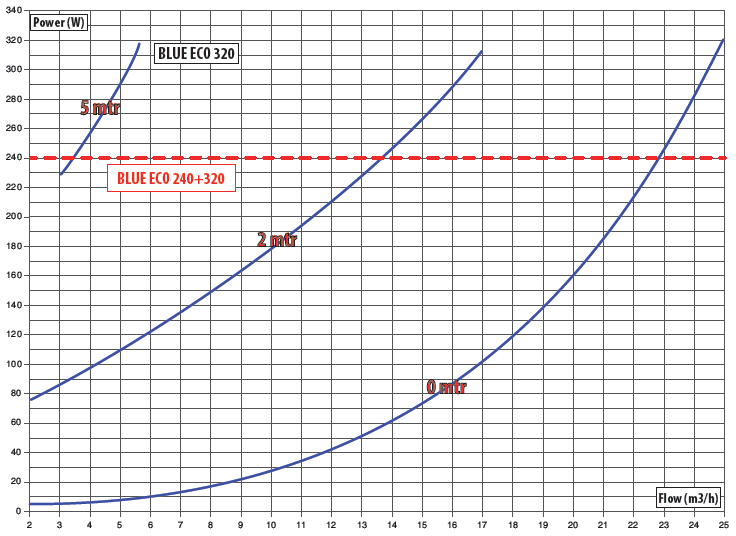 In these curves you can see the performance of a few Blue Eco pumps at different heads. 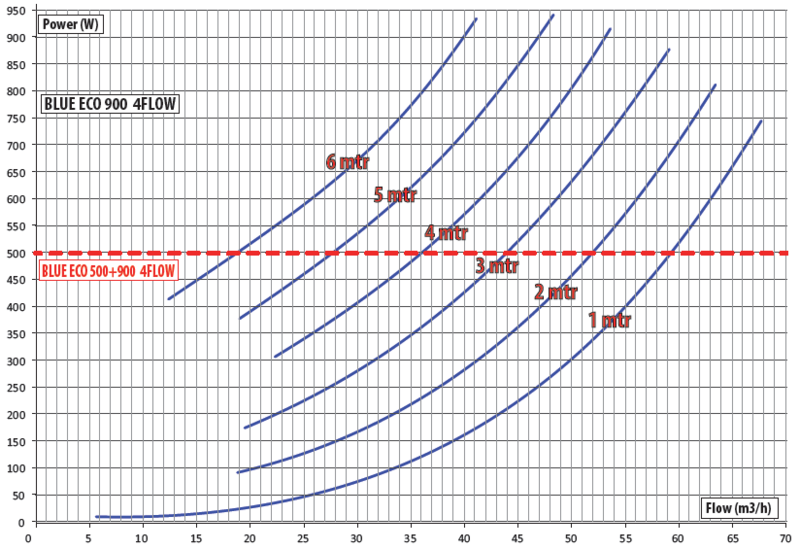 The parting line at 240 Watt shows, where the capacity of the 240 Watt pump stops. 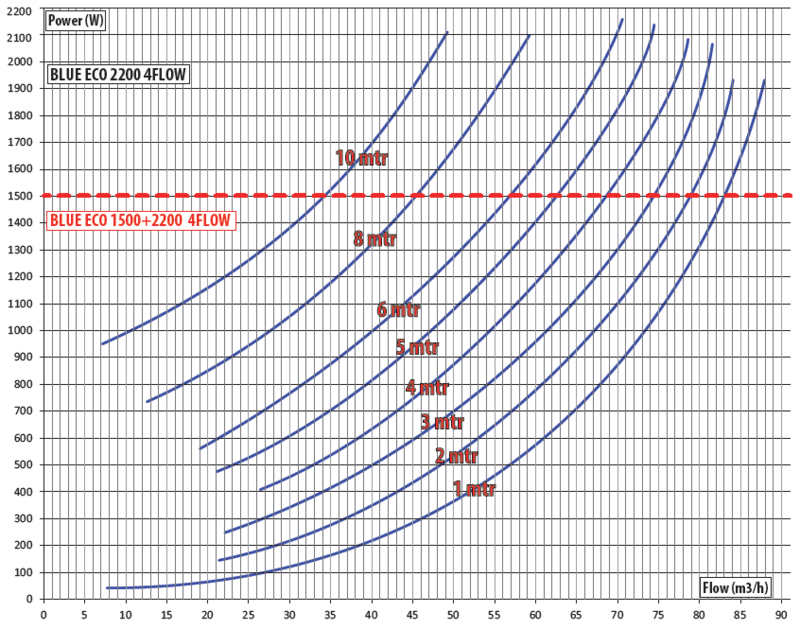 Above this parting line the values are only valid for the 320 Watt version. The parting line at 500 Watt shows, where the capacity of the 500 Watt pump stops. Above this line the values are only valid for the 900 Watt version. The parting line at 1500 Watt shows, where the capacity of the 1500 Watt pump stops. 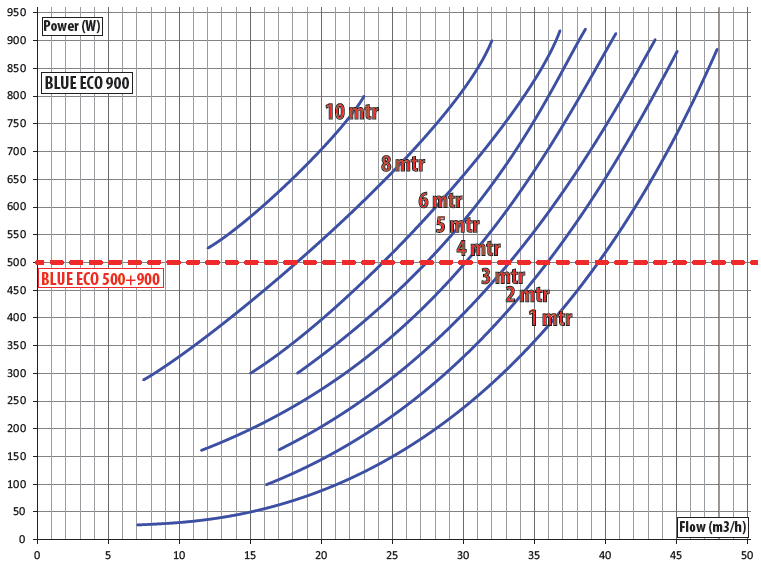 Above this line the values are only valid for the 2200 Watt version. From January 1st 2016, SIBO Fluidra took over all the distribution and service activities for the Blue Eco pumps from Estrad B.V. In recent months, both companies cooperated closely to transfer the necessary knowledge and equipment to SIBO Fluidra. SIBO Fluidra becomes the main contact for all dealers and users. Where to buy Blue Eco pumps? SIBO Fluidra distributes Blue Eco pond and pool pumps all over the world through a large dealer network. So an internet search should yield results for one in your surrounding. Contact us if you want to become an official Blue Eco dealer. We are always looking to expand our network.